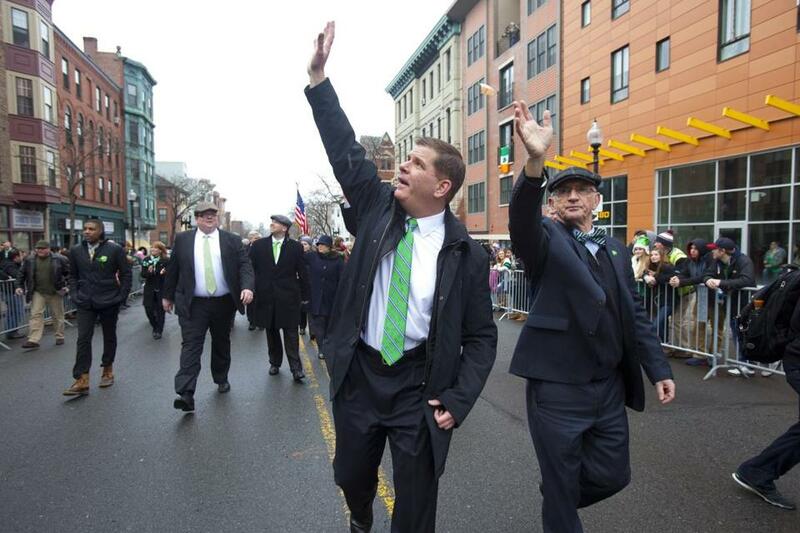 Boston Mayor Marty Walsh marched in the St. Patrick&apos;s Day Parade in 2015. 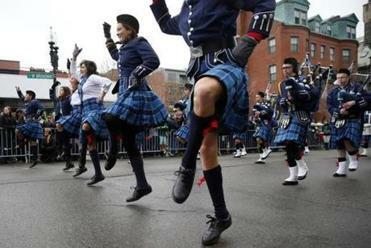 The city of Boston has decided to shorten the St. Patrick’s Day Parade, following the same route it used last year when record snowfalls clogged South Boston streets. The abbreviated route will begin on West Broadway at Dorchester Avenue, follow West Broadway to East Broadway, and end at Farragut Road, Boston Police Commissioner William B. Evans said. The parade is scheduled for 1 p.m. March 20. “After consulting with Commissioner Evans, I have decided that it is in the best interest of public safety, while balancing the historic tradition of the St. Patrick’s Day Parade, to use the same route that we did last year for this year’s parade,” Mayor Martin J. Walsh said Tuesday in a statement. The Allied War Veterans Council of South Boston, which organizes the 115-year-old event, opposes the plan, which it says cuts the route in half, parade organizer Tim Duross said. He said the group is planning a news conference for Wednesday afternoon in Dorchester Heights, which is not part of the abbreviated march. Openly gay groups participated for the first time and Boston’s mayor marched for the first time in two decades. Evans said the shorter route is better for public safety. In recent months, he said the city has shortened routes for J’ouvert, the daybreak celebration that is part of Boston’s Carnival Day festivities; the People’s Procession during First Night; and the Greek Independence Day Parade. Last year’s abbreviated route, which measured about 2 miles, was easier for officers to patrol and for emergency vehicles to navigate because it took up a smaller stretch of South Boston, Evans said. The commissioner credited the shortened route for fewer episodes of public drinking and disorderly conduct. Evans said last year’s shorter parade helped lower police overtime costs by $90,000 and required about 150 fewer officers than 2014, the last time marchers followed the traditional route. Calls for police assistance dropped from 239 to 166, Evans said, and requests for emergency medical services dipped from 143 to 63 from 2014 to 2015. Duross said organizers learned the city wanted to shorten the parade during a Feb. 22 meeting with city officials. The new route means marchers will not pass several landmarks, including Dorchester Heights, some neighborhood veterans’ posts, and the home of the late John “Wacko” Hurley, a longtime parade organizer who died last year, Duross said. Dorchester Heights is a significant location because the parade is connected to Evacuation Day, which commemorates a Revolutionary War victory on March 17, 1776, he said. Colonists forced British troops to evacuate by secreting cannons on Dorchester Heights. “It’s important that we go by there,” Duross said. The parade traditionally began on West Broadway and went to East Broadway, where marchers turned right onto P Street. The route then headed west, ending at Andrew Square. 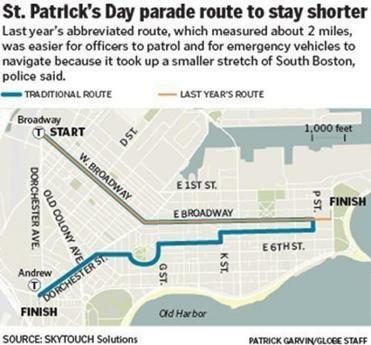 Organizers are concerned the shortened route will force large crowds into a smaller area and will strand paradegoers far from South Boston’s subway stations, Duross said. For the second year in a row, the parade accepted groups representing the gay community. Boston Pride and OUTVETS, which honors lesbian, gay, bisexual, and transgender veterans, are participating, Duross said. Organizers rejected an application for Veterans For Peace, which for many years held a peace parade after the traditional procession. Pat Scanlon, coordinator emeritus for Veterans For Peace, said his group was rejected because parade organizers do not approve of its mission and its support for Muslims. Duross disputed Scanlon’s account. He said the group was rejected because it protests the US government. The US Supreme Court ruled in 1995 that the parade is a privately organized event protected by the First Amendment right to freedom of speech and that organizers could include, or reject, any group.